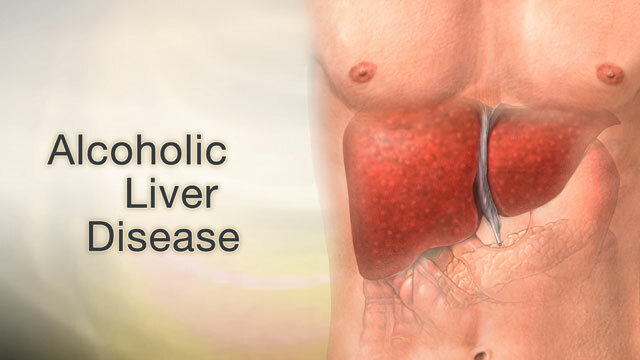 Alcoholic liver disease occurs after years of heavy drinking. Over time, scarring and cirrhosis can occur. Cirrhosis is the final phase of alcoholic liver disease. Alcoholic liver disease does not occur in all heavy drinkers. The chances of getting liver disease go up the longer you have been drinking and more alcohol you consume. You do not have to get drunk for the disease to happen. The disease is common in people between 40 and 50 years of age. Men are more likely to have this problem. However, women may develop the disease after less exposure to alcohol than men. Some people may have an inherited risk for the disease. There may be no symptoms, or symptoms may come on slowly. This depends on how well the liver is working. Symptoms tend to be worse after a period of heavy drinking. Eat a healthy diet that is low in salt. Get vaccinated for diseases such as influenza, hepatitis A and hepatitis B, and pneumococcal pneumonia. Talk to your provider about all medicines you take, including herbs and supplements and over-the-counter medicines. When cirrhosis progresses to end-stage liver disease, a liver transplant may be needed. Many people benefit from joining support groups for alcoholism or liver disease. Alcoholic liver disease is treatable if it is caught before it causes severe damage. However, continued excessive drinking can shorten your lifespan. Cirrhosis further worsens the condition and can lead to serious complications. In case of severe damage, the liver cannot heal or return to normal function. Talk openly to your provider about your alcohol intake. The provider can counsel you about how much alcohol is safe for you. Asiedu DK, Ferri FF. Alcoholic hepatitis. In: Ferri FF, ed. Ferri's Clinical Advisor 2018. Philadelphia, PA: Elsevier; 2018:59-60. Carithers RL, McClain C. Alcoholic liver disease. In: Feldman M, Friedman LS, Brandt LJ, eds. 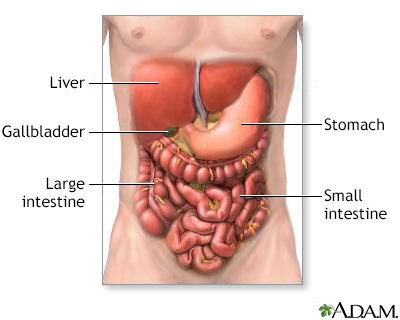 Sleisinger & Fordtran's Gastrointestinal and Liver Disease. 10th ed. Philadelphia, PA: Elsevier Saunders; 2016:chap 86. Haines EJ, Oyama LC. Disorders of the liver and biliary tract. In: Walls RM, Hockberger RS, Gausche-Hill M, eds. Rosen's Emergency Medicine: Concepts and Clinical Practice. 9th ed. Philadelphia, PA: Elsevier; 2018:chap 80. Hübscher SG. Alcohol-induced liver disease. In: Saxena R, ed. Practical Hepatic Pathology: A Diagnostic Approach. 2nd ed. Philadelphia, PA: Elsevier; 2018:chap 24.